Clocks may be becoming antiquated artifacts in our current digital age, but New Year’s Eve continues to lend them special significance each year. 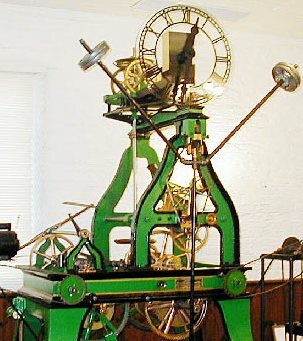 Clocks also comprise important elements in the collections of historic houses and museums across the state. This mantle clock from the Reynolda House Museum of American Art in Winston-Salem features Roman-style satyrs flanking the clock’s marble face and suggesting the revelry of a New Year’s celebration. The following sampling of clocks from a variety of North Carolina collections offers a range of design and provenance. 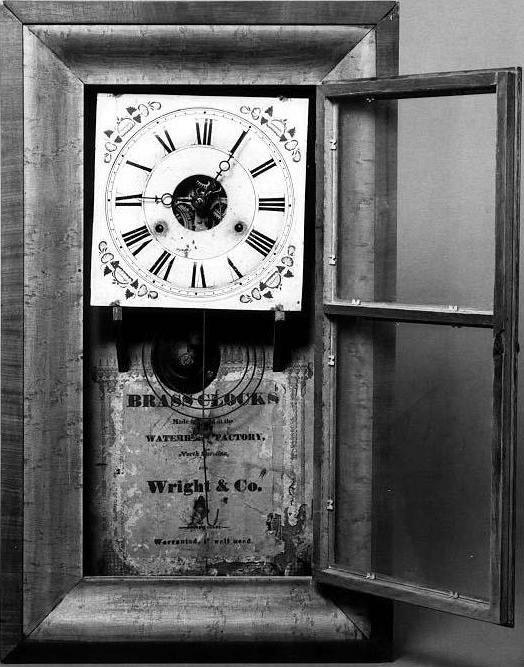 Two clocks from different NC Historic Sites span nearly a century. The museum at Duke Homestead displays the clock on the left as part of a 1950s period room setting with a television that loops cigarette advertisements. 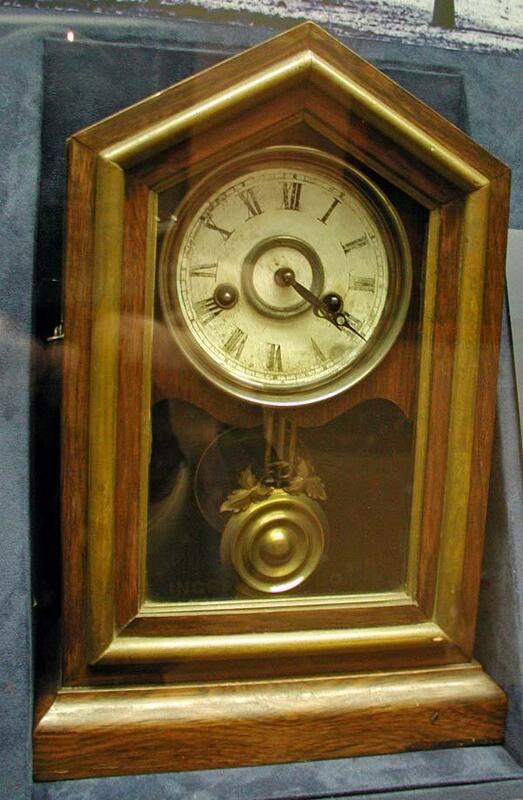 Governor Charles B. Aycock marked time with the shelf clock on the right, c. 1861-1880. 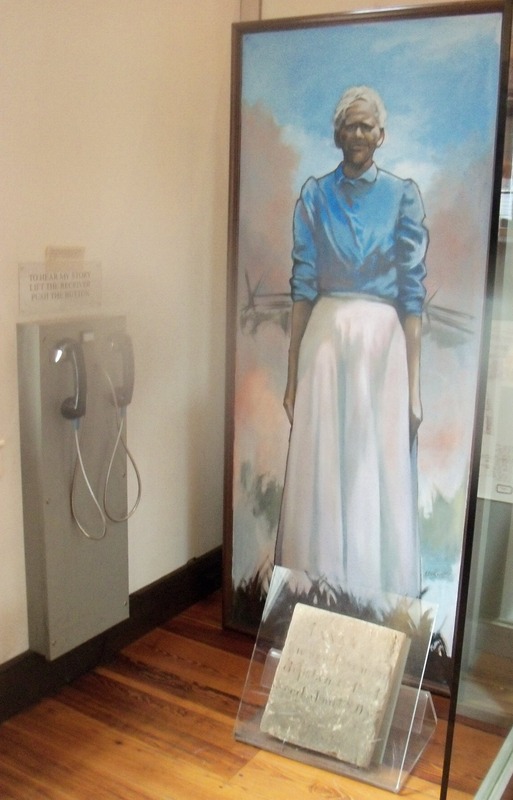 The piece is now in the exhibit hall at Aycock Birthplace. The BradyJefcoatMuseum, part of the Murfreesboro Historical Association, houses an interesting piece (right) that multitasks as both a hall tree and a clock. 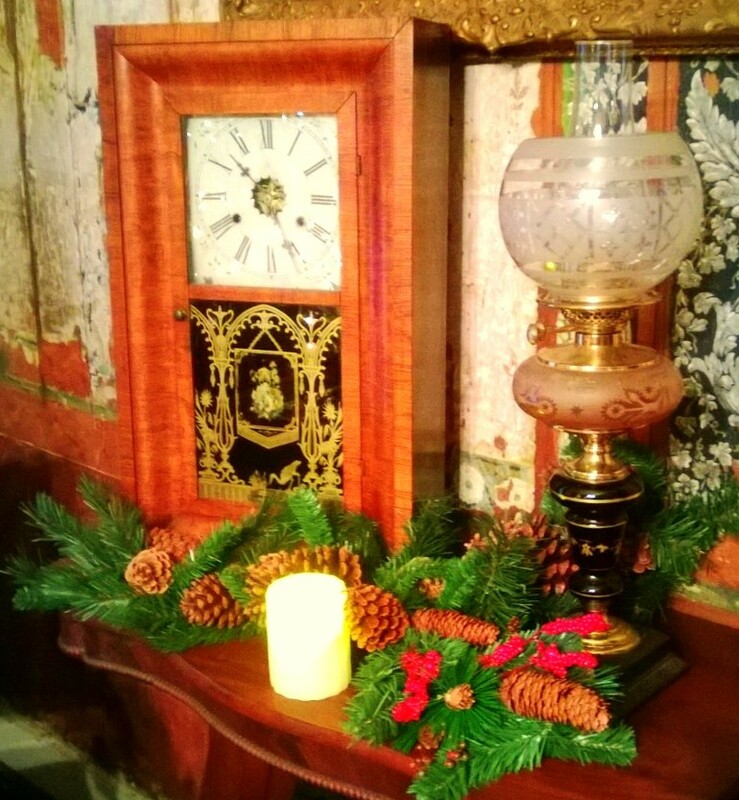 A tall case clock marks time in the foyer at Ayr Mount (left). Thomas Emond, a Raleigh clock maker and silversmith, made this piece for William Boylan of Raleigh in the early 19th century. 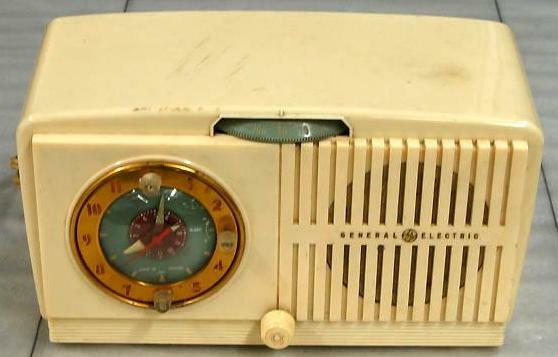 An electric clock radio, also in the NCMOH collection, dates to c. 1950. The Moore County Historical Association displays two similar mid-19th-century shelf clocks. The one in the c. 1790s Garner House (left) sits atop a paneled hearth and the other in the 1820s Shaw House (right) also rests on a mantle. 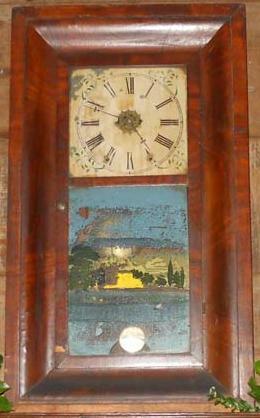 A small clock helped structure the day and added charm to the 1930s kitchen wall at the Penderlea Homestead. 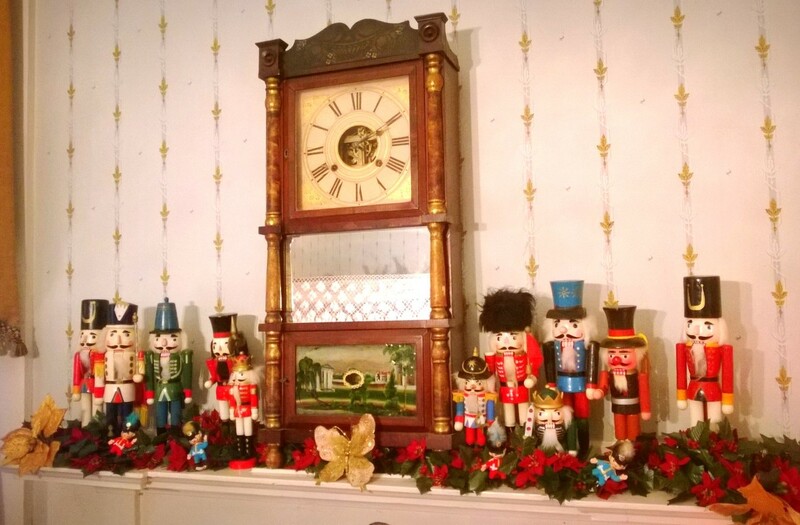 Two more mantle clocks grace the 1820 Dr. Josephus Hall House in Salisbury. Both have well preserved reverse-glass paintings. The clock above with turned elements has a landscape scene and the one on the right includes a more geometric gilt design. Decorations for special holiday tours with the theme “Toyland, Toyland,” surround each. More than 10 volunteers spent over a thousand hours restoring the 1911 Seth Thomas clock from the New Bern City Hall tower. The Fireman’s Museum, just down the street from the site the clock operated until 1999, hosted the work in progress. The clock was installed in the North Carolina History Center at Tryon Palace in 2010–in time for New Bern’s 300th anniversary celebration. The turning of every year warrants some kind of festivity. Have fun counting down the last moments of 2013 and HAPPY NEW YEAR from NC Connecting to Collections! 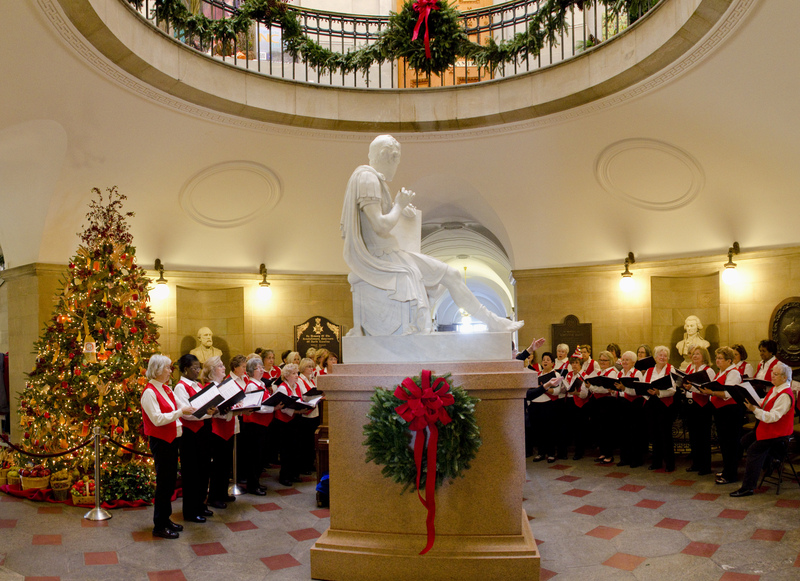 Earlier this holiday season, Raleigh’s Cardinal Singers caroled under the rotunda of the Old State Capitol. To the left is a Christmas tree bedecked with representations of NC agricultural products. Staff and volunteers at other historic sites were equally creative when it came to designing thematic Christmas tree decorations. At left, the beautiful 1820 Dr. Josephus Hall House has been decorated by volunteers with the theme “Toyland, Toyland” this year. Special Christmas tours run on Saturdays and Sundays through 12/29 and have been held every year since Historic Salisbury Foundation purchased the house in 1972. Staff from Town Creek Indian Mound State Historic Site set a great example for partnering with a local library by installing the Town Creek tree in the Montgomery County Public Library in Troy (right). 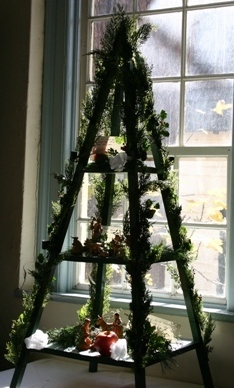 Each year the library hosts trees from various organizations across the county. The Town Creek tree is decorated with reproductions of ancient American Indian artwork. The Federal Point Historic Preservation Society is offering customized ornaments that reflect their local coastal heritage mission. 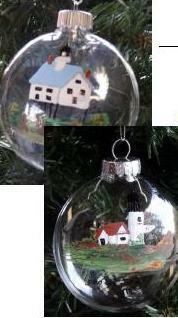 Each hand-painted ornament by Brenda Coffey displays a view of one of the 3 different Federal Point Lighthouses. 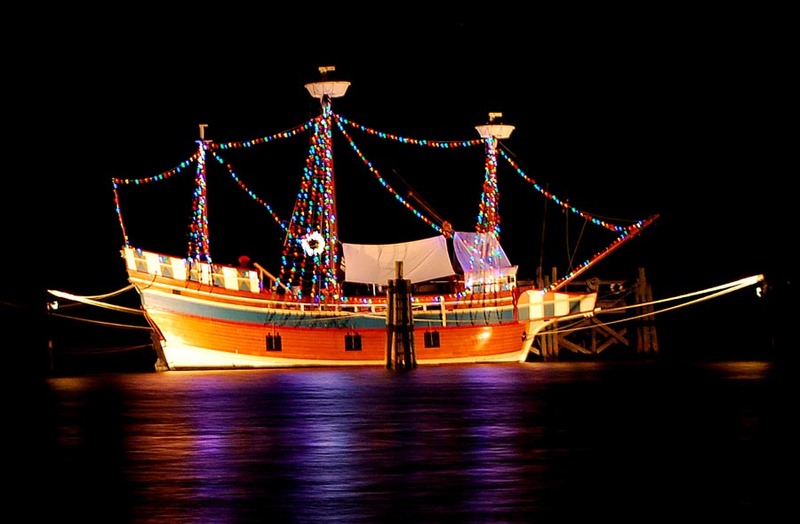 Another holiday scene with unique coastal flair is The Elizabeth II, a reconstructed 16th-century ship, ablaze with lights. Roanoke Island Festival Park‘s current exhibit, “Elizabeth II- 30 Years of History,” tells the story of the construction of the ship from framing to launching. The exhibit will continue through December 31st. 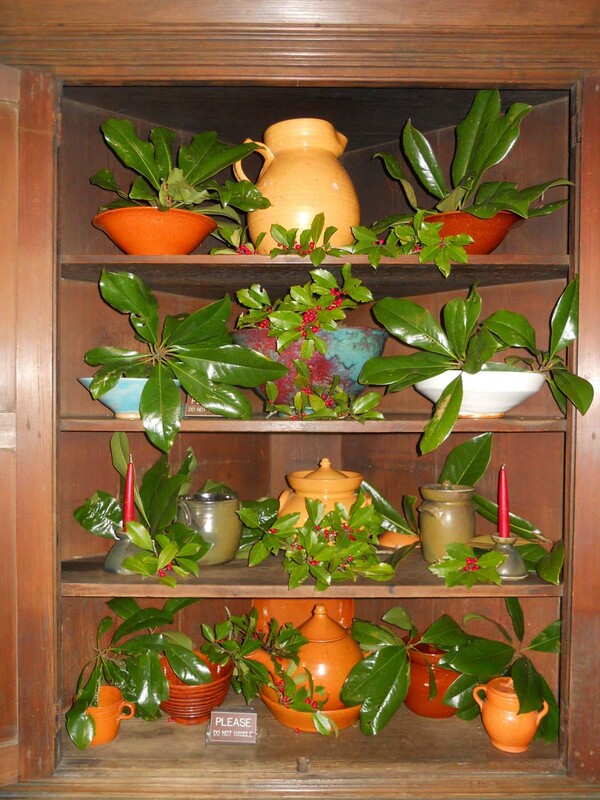 At Moore County Historical Association‘s 1820s’ Shaw House (left) local greenery enlivens a corner cupboard filled with Jugtown pottery. 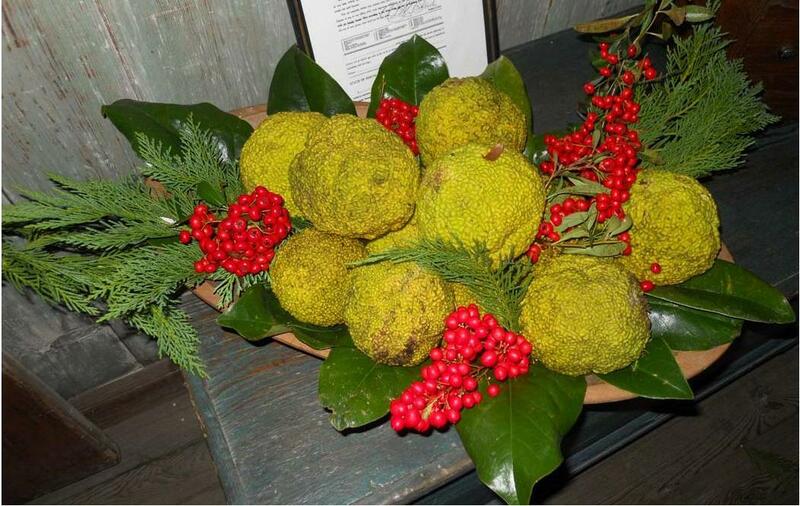 Volunteers arranged locally grown foliage, including osage-oranges (right), to create beautiful decorations at both the Shaw House and the 1790s’ Garner House. 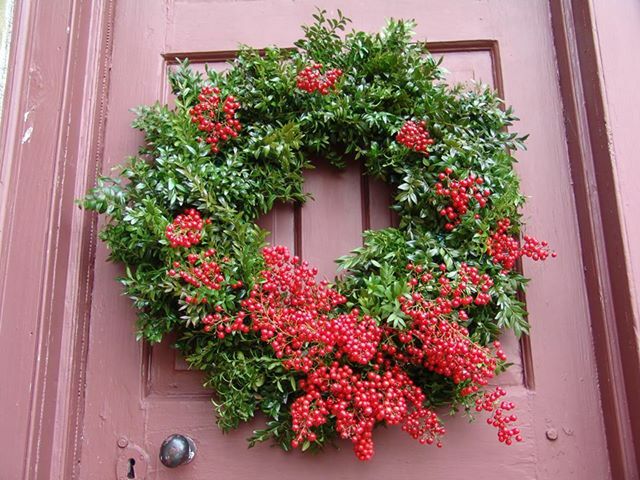 Decorators at Historic Bath gathered boxwood and berries to shape an elegantly festive door wreath. 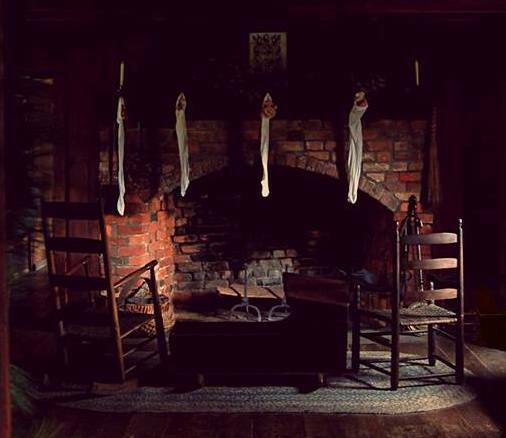 In the mountains, the dim light of the solstice season filters through a window at Zebulon B. Vance Birthplace to illumine stockings hung by the hearth at the 19th-century log cabin. 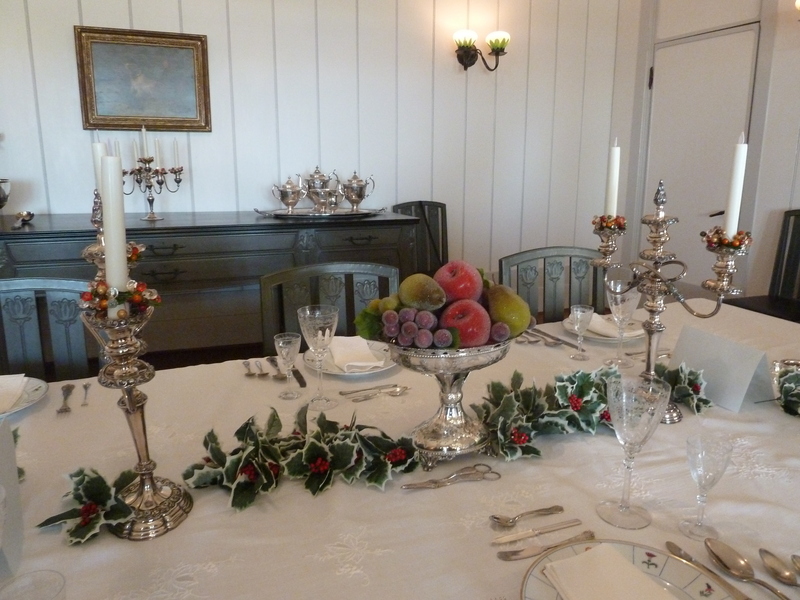 At the other side of the state, the dining room at the Whalehead Club on the Outer Banks sparkles with polished silver and festive faux fruit and foliage (safest for preservation). The Whalehead Club staff and volunteers decorated 11(!) 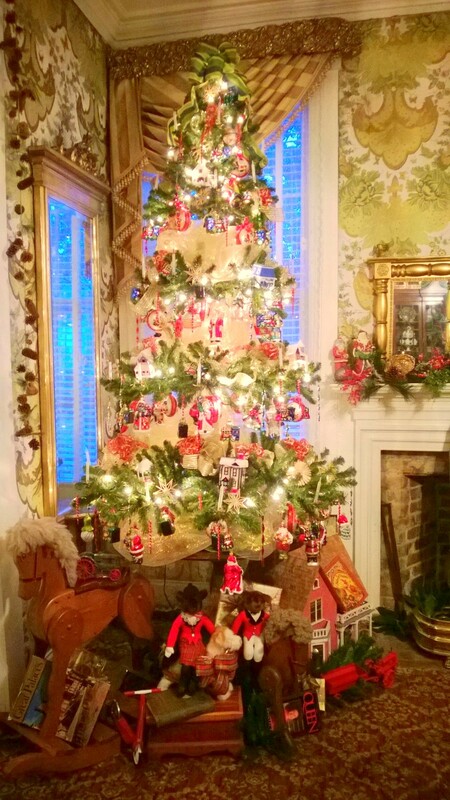 trees in the main house, each with a different theme, and Currituck County School children decorated 40(!) trees in the basement as part of a reading challenge. See a slideshow of some of their trees here. Special candlelight tours Thursday, Friday and Saturday evenings from 6p.m. to 8:15p.m. showcase the extensive decorations and run until December 28th. 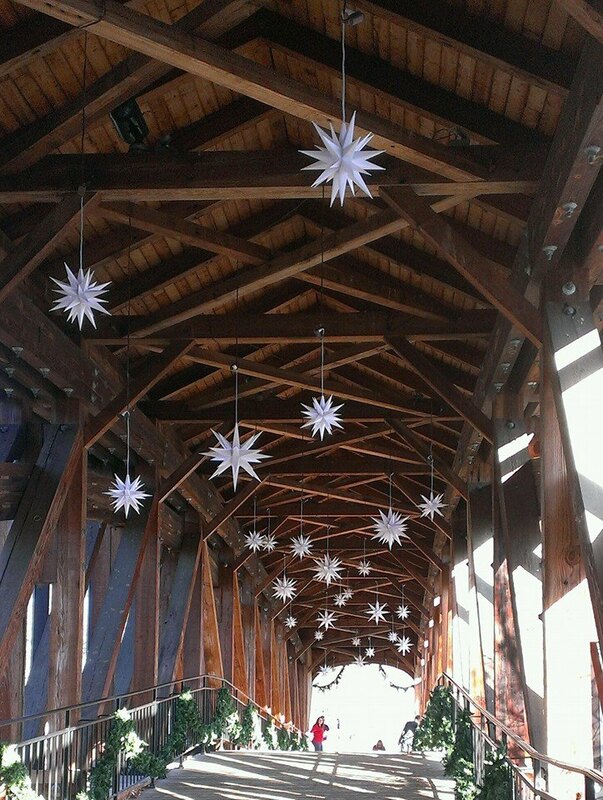 Old Salem highlights two Christmas decorations each year: the tabletop evergreen pyramid and the Moravian star, many of which dangle from the rafters of the covered bridge leading from the Visitors Center to Main Street. Our C2C team wishes all the best for our cultural heritage community this holiday season and into the New Year. We hope that the hard work you’ve put into decorations and special activities pays off by growing your audience and deepening your participants’ engagement with your site and its collections. Thanks to Kym Maddocks, Manager of Research & Interpretive Operations at Old Salem for her assistance with this post. History organizations often want exhibits to tell important stories but stall out when they run up against a dearth of artifacts to represent particular topics. Old Salem came up with an innovative solution to the problem of portraying past lives with few documentary and artifactual traces. Old Salem contracted artist Warren Parker to develop an exhibit about ten 19th-century African-Americans, many of whom had been enslaved, for the newly reconstructed African Moravian log church heritage center. Parker chose to feature a variety of artistic media to evoke these past lives in conjunction with salvaged grave stones and bits of biographical information found in Old Salem’s collections. A new addition to St. Philip’s brick church in 1890 covered over several African-American graves. Although no human remains had been disturbed, many of the other stones from the front lawn of the church were removed soon afterward and placed in a pile under the front steps of the building. The exhibit displays each encased headstone, alongside Parker’s artistic representation of the person it commemorates. Parker sculpted several from various materials; other media include an oil painting, a man’s photograph enlarged to life size, a metal silhouette, and a carved wood panel. Each representation is life sized or larger to suggest a proportional comparison for each visitor in a way that appeals to both adults and children. Based on the grave stones and extant documents, Old Salem staff was able to sketch out a life story for each of the ten African-Americans. The institution then arranged with drama students and staff from the nearby UNC School of the Arts to record first-person interpretations of each life. Visitors can pick up a receiver and push a button to listen to each. (At left, young visitors enjoy the story of Christian David. See, http://travelncwithkids.blogspot.com/2012/06/old-salem-tour-of-african-american.html to learn more about their visit.) 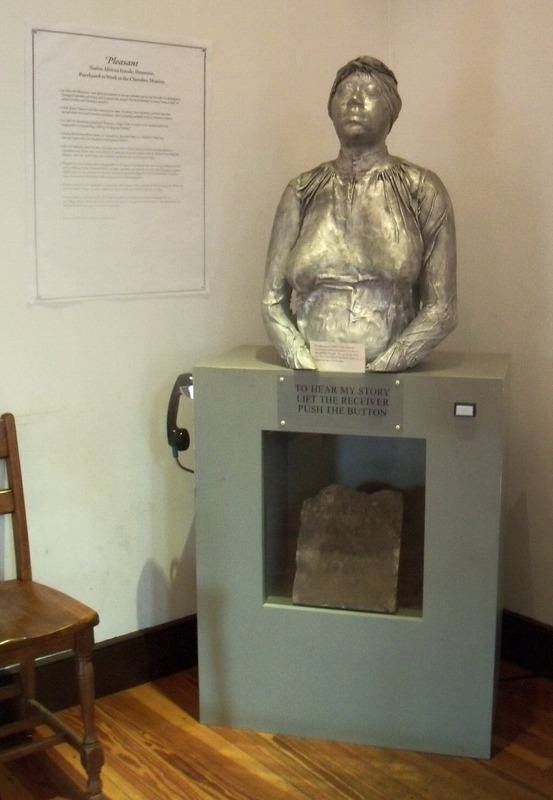 Although paper labels nearby present similar information, the ability to listen to a first-person narrative, while viewing a life-sized representation, conjures the humanity of the past life in a way that many other historic sites could replicate. When I was a young college senior majoring in music education, we had to take numerous philosophy and methods of education classes the semester before we began student teaching. Every scenario presented in those courses was touted as the greatest achievement in public education since the eraser. The difficulty was that once I began student teaching, armed with all of the beautiful templates of how to make every child a gifted learner and devoted scholar, I promptly fell flat on my face. Why did this happen? Because every situation presented to me in those ivy covered classrooms prior to my clash with the reality of public school systems, was delivered under the ideal circumstances, with the ideal students, who had been raised by the ideal parents and funded from the magical unlimited budgets of the state and local coffers. Since then, I have always been skeptical of anything presented as the” perfect solution” that was not grounded in real life experiences. I encountered this delicate dance again in November when C2C presented a fire recovery workshop in Buncombe County, North Carolina. There is always a compromise in teaching this sort of disaster strategy between what is laid out in the formal, rigid structure of ICS (Incident Command System) and the bureaucracy of municipalities, and what needs to happen immediately. 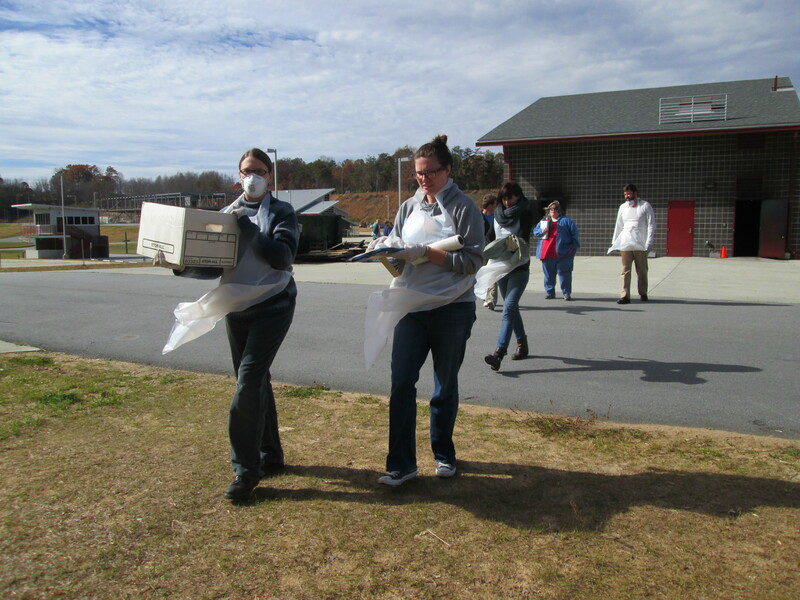 Archivists, conservators, museum directors, librarians and any other staff can spend significant amounts of time on the disaster plan, telephone tree, duty assignments, and practice drills, only to see it all crumble when told that the city inspector gives you ten minutes to empty the facility before he chains off the door for safety reasons. So why do we teach the complex system of ICS? And why do we preach the importance of inventory updates, off-site storage of the disaster plan, electronic back up and how to care for the cracked dinnerware and fragile, sooty textiles? Why does the workshop include ICS and not just emphasize urgent, immediate rescue? We include it because we have a responsibility to the people in charge of these museums, historic homes and historic sites to prepare them in the best way possible – not if, but WHEN – a disaster happens on their watch at their site. Granted, in an unexpected disaster, there is the sense of urgency and immediacy to rescue collections and protect all items from further damage or loss. If everyone just runs helter-skelter, there may end up being more damage, confusion, theft and breakage than if there is a pre-thought-out and prepared plan. Certainly, things will not go systematically in the perfect order with the perfect professional conservators on hand to give their wisdom and expertise, but being blind-sided by a fire, flood, tornado or mold infestation, is far worse when there is no organized course of action (or structure) to implement. We know that there is a real life energy and sense of urgency surrounding a disaster and, also, that there is a textbook response to a disaster and we know that the best possible, most productive response lies somewhere in the middle. We will keep listening to feedback, reworking the agenda, and re-structuring the workshops, practice burns, and artifact recovery until we have balanced the two opposing forces. Our reality is that we hope this is all wasted time on our part and your part. We desperately hope that there is never any kind of trauma or disaster at your museum, historic site or home. However, in the chance that if – and when – it does occur, all of the advance preparation will prove valuable in preserving these pieces of history for all future generations. We will keep providing opportunities for you to have as much training as possible. We are not the ivy-covered walls of college, nor do we want to set anyone up for failure. However, a pre-determined response that addresses the issues of administrative, logistical, operational and planning needs (that is implemented and carried out at a disaster site) will bring order to chaos. Being prepared is the best reality training possible. Knowing your options and having a plan will help prevents panic and additional, smaller disasters from occurring at the site. All of this will help you manage a difficult situation in trying circumstances. Remember that NC Department of Cultural Resources is always here with (free) conservators, archivists and specialists on hand to assist immediately after and in the long-term recovery. CREST team members will respond from across the state and a local response will begin with the *ACREN groups.